Montana Marijuana Testing Laboratory Bond • Surety One, Inc. Under its rulemaking authority, the Department of Health and Human Services promulgated a rule requiring a Montana marijuana testing laboratory bond from license applicants for this class of business. The new protocols added a statutory requirement that laboratories follow the testing lab "Guide" be followed and two financial assurance mechanisms. Section 15 obligates the licensee to maintain analytical testing laboratory professional liability insurance with an aggregate limit of no less than one million dollars. The Montana marijuana testing lab surety bond (Section 16) must be issued in the amount of twenty five thousand dollars ($25,000), run to the Department of Health and guarantee adherence to the security plan approved by the department, or operate the lab in a manner that allows for or results in theft, loss, or diversion of marijuana products. The application process must be accomplished through the Montana DOH Medical Marijuana portal. 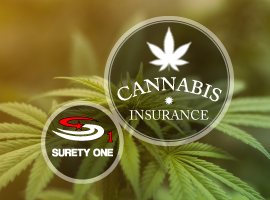 Montana surety bond leader, SuretyOne.com is the most agile underwriter of the surety bonds needed by the medical marijuana sector. We firmly believe in supporting the availability of cannabis products to those that benefit from them. We will consider applications for dispensaries, processors, researchers, delivery services, testing labs and grow operations in all states where current legislation favors legal marijuana businesses. For further information about the Montana medical marijuana testing lab bond contact us at (800) 373-2804, email Underwriting@SuretyOne.com of chat with us live here.